73” discharge height at discharge valve outlet (valve not shown), 45° dump angle. Accepts and discharges drums of pure silicon beads used in the manufacture of semi-conductors. 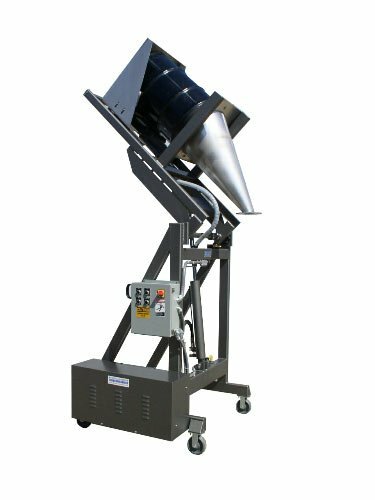 316-2b stainless steel pour cone includes a custom removable UHMW polyethylene liner to ensure product purity. Interior of pour cone (beneath UHMW liner) included Dupont Tefzel® coating. Portable design includes special 6” Ergo GT low-rolling resistance casters. Dust-tight Lift & Seal™ system hydraulically seals drum to the pour cone. Tubular carbon steel frame construction with continuous welds for easier equipment cleaning. Flat bottom stainless steel skip for easy floor level drum loading. Features a 1500 psi hydraulic pumping unit for reliable operation. Hoffman NEMA 12 carbon steel enclosure with rotary disconnect. Control enclosure includes a “Zero-Force” touch switch for added operator safety.